Fantasy fans! Roleplaying gamers! Geeks! Lend me, and Audible.com, your ears! For I have news people! Some of you may have heard of author R.A. Salvatore, well known fantasy writer perhaps best known for his “Forgotten Realms” novels (which is a setting for the roleplaying game Dungeons & Dragons). If not, now you have. He’s kind of a big deal in certain circles. Well keep following me. He also wrote a series of books referred to as the DemonWars Saga. It’s two trilogies bridged by a single book, “Mortalis”. The Saga is Book 1: “The Demon Awakens”; Book 2: “The Demon Spirit”; Book 3: “The Demon Apostle”; Book 4: “Mortalis”; Book 5: “Ascendance”; Book 6: “Transcendence”; Book 7: “Immortalis”. The Saga has an accompanying roleplaying game called “Demon Wars”. It’s hard to summarize 7 books so here’s the link to its Wikipedia entry if you’re interested. “Mather’s Blood” takes place before the start of the DemonWars Saga and tells of the ranger Mather Wyndon, uncle of Elbryan, a central figure in DemonWars. “A Song For Sadye” offers new insights into the life of the bard, Sadye, who plays an important role in the second DemonWars half of the DemonWars Saga. “The Education of Brother Thaddius” picks up the DemonWars story immediately following “Immortalis”, the last book of DemonWars, and opens the door for the next saga in the world of Corona. First printed in the DemonWars: Reformation Core Rule Book, “The Education of Brother Thaddius” highlights the troubles in the in Abellican Church, battered by the De’Unneran Heresy and struggling to survive in a world ravaged by wars and demons. And in case you weren’t excited, guess who is reading these? Wil Wheaton and Felicia Day! If not THE King and Queen of Geeks, they are certainly our royalty. I know what you’re wondering. What does THAT sound like? 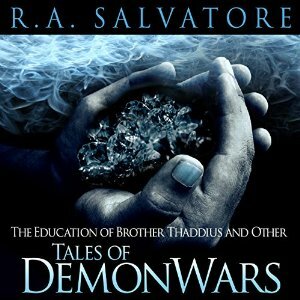 “The Education of Brother Thaddius and Other Tales of DemonWars” is for sale now on Audible.com. Originally I had wanted to review this before the holidays, in the thought that people would want to give it as a Christmas gift, but things sometimes don’t work out as planned. 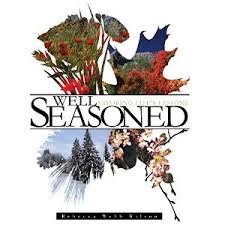 However it isn’t that big of a deal because it turns out the “Well Seasoned: Savoring Life’s Lessons” by Rebecca Webb Wilson is the perfect gift for all seasons. So stay tuned as I clue you in on a great book for you, and probably for lots of people you know. Rebecca Webb Wilson is a professional nature photographer who has climbed Mt. Kilimanjaro, the Swiss Alps part of the Haute Route, and the Inca Trail to Machu Picchu. She began her professional career as a Pan American World Airways stewardess, did a brief stint as a realtor, then went to law school eventually serving several years as an Assistant United States Attorney. The point I’m trying to make here is that Wilson is a creative, intelligent woman who has, and is still, living an amazing life. That life translates to “Well Seasoned”. The book is divided into four seasons. Surprising, I know. 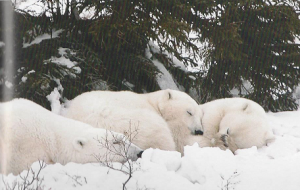 Wilson discusses how we often draw parallels between the seasons of our environment and the cycles of our life. Traditionally we view spring with birth and childhood, summer with adulthood, fall with maturity, and then winter with decline of the elderly. 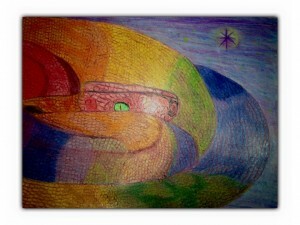 But she comments that this isn’t necessarily based in reality. 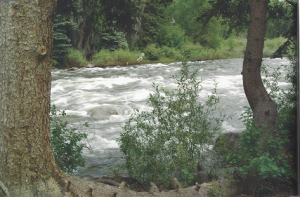 That for many, the later years of life are a time of rebirth thanks to retirement. New careers are started. Educations are continued. New passions are discovered, or old passions are pursued once again. That could make those years spring time. Suddenly the seasonal metaphor is all kinds of exciting and up for grabs. With that in mind, Wilson starts us off at summer and childhood. From there it’s autumn, winter, and spring. 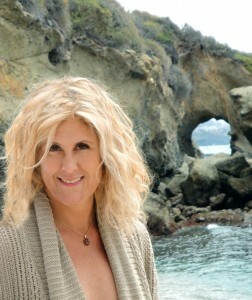 Each chapter shares her personal insights, reflective poetry, and the lessons learned in each season. And of course, beautiful photos. Rebecca Webb Wilson has crafted a book of wisdom that can speak to new parents, recent retirees, graduates, and anyone else looking for a different perspective on a new phase of their life. Great article on the fonts and symbols used in the movie Alien, and how they influenced other scifi movies. Bonus points for a tie-in with The Secret Doctrine by Helena Blavatsky. Yeah, you read that right. Projected images that have haptic feedback — meaning you can feel them. Go ahead and let your brain explode on that one. You remember that Tolkien book, the one that is basically lifted from his hand-written notes about the world of the Lord of the Rings, but it is basically unreadable except as a reference work? Yeah, this German art student decides to just go ahead and create a copy of the book by hand. It’s awesome. Yeah, that headline pretty much tells the whole story, but for the details, read the article. Nope, not the same as the link above. This is more like a telepresence version of that toy with all the pins in it that everyone always presses their hand into. Only with color. Ever wonder how Gandalf got to be so badass that he could go toe-to-toe with a Balrog? Check out the video! While it’s still the start of 2015 I’m happy to share something neat that came through my inbox. 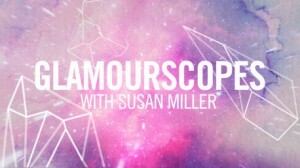 It turns out that Glamour magazine has teamed up with Susan Miller, the founder of the Astrology Zone website, to bring us Glamourscopes! Glamourscopes is where you can find year-long outlooks for each astrological sign in fun video formats. For example, I’m a Gemini. Here’s what Ms. Miller has for me. Obviously I’m happily married so none of that, getting’ yo’ self a man stuff interests me. However, will this be the year that my health issues take a turn for the better? That will be a thing to watch. Not lucky enough to be a Gemini? You can watch your year-long out look here. Well folks, it is time again for me to talk about the classic “Fahrenheit 451” by Ray Bradbury. The last time we talked about it was in January 2012 when I talked about how Bradbury’s thoughts on e-books evolved (The Temperature at Which the Kindle Burns). In the article I declared I would never buy “Fahrenheit 451” as an e-book. However neither I, nor Bradbury, have/had any hang ups about audio books and that is a very good thing because I have news. Guess who has reached out to the little ol’ Magical Buffet? Audible.com. Oh yeah baby. And one of the many, many, many wonderful things they’ve let me in on to share with you is that there is a new audio book version of “Fahrenheit 451”. Who narrates you ask? Just Tim Robbins. As in Tim “Bull Durham, Mystic River, Shawshank Redemption” Robbins. I guess what I’m saying is, he’s got skills and yes, said skills do in fact pay the bills. 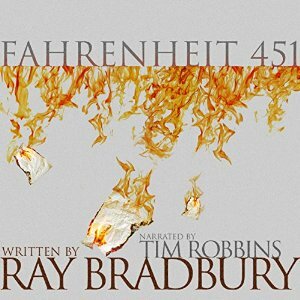 For those of you unfamiliar with “Fahrenheit 451” (how is that possible? ), let me blurb you. You get your copy here. It’s January and although I’m not a fan of the New Year’s Resolution the start of the year is a great time to pick up your 365 day, or your “something” a day, type of book. 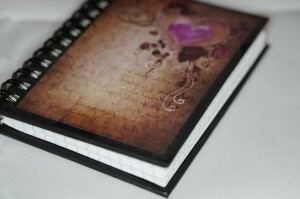 Now I happen to have in my possession the most adorable little spell a day book you could ever want to own. 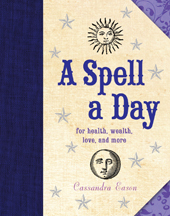 “A Spell A Day: For Health, Wealth, Love, and More” by Cassandra Eason is an amazingly diverse book of spells that quite literally has a spell for every occasion. First off, there are 366 spells in case of it being a leap year. Good catch Eason! Second, her introduction mentions that idea of opening the book for a spell at random. Suggesting that perhaps the spell you need will find you. I love that kind of thing. Third, it has a great index. With spell books, you want a good index because at some point you’re going to want to find some spell you read and you are NOT going to remember what day it was on. Lastly, did I mention how cute it is? For reals yo. It fits perfectly into my small girl hands, and more importantly I can hold it open with one hand, which means just about anyone should be able to hold it while casting spells. It has a nice heft. It’s got a nice fabric and embossed spine. The font is in purple (I like purple). If the spells weren’t done so well, you could mistake “A Spell a Day” as a puff piece based on the book’s lovely physical appearance. Just remember, you should never judge a book by its cover. Just consider it a bonus feature when it’s awesome! Cassandra Eason has crafted an interesting and diverse book of spells that, in my opinion, a beginning or experienced magic practitioner would find worth adding to their collection. Many times I had to fake it till I made it, but it worked! Each time I shifted my consciousness and vibration around an issue the issue dissolved, and things worked out. Now that’s not to say it was always in my favor, its just that the way I felt about the situation and my perceptions shifted, so I was happier.